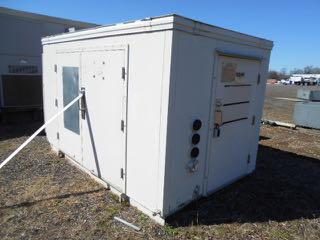 Composite Shelters - UsedShelter.com - Used Telecom Shelters & Cabinets for surplus/bargain prices! Composite Shelters have been designed and developed as a low-maintenance alternative to standard Aluminum shelters. Typically constructed of lightweight composite panels and steel end-bands and base-frame, these shelters provide superior corrosion resistance and durability. Composite materials allows shelters to withstand a variety of environmental conditions while providing all the transportation advantages of the standard ISO configuration.